The Cassini spacecraft has been studying Saturn and her moons for nearly 20 years, and is now finally running out of fuel. 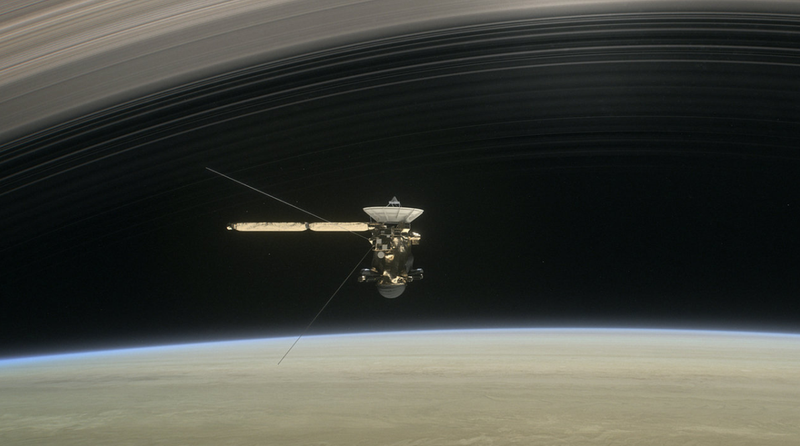 The Cassini mission is set to end this September, but not without a big finale. It’s a Grand Finale, even, and it’s going to end with Cassini plunging into Saturn’s atmosphere. Before that though, it just went between Saturn and its rings for the first time ever, and we have the very first images. The reason Cassini is being dumped into Saturn’s atmosphere to be incinerated is actually pretty exciting: it’s because NASA doesn’t want to risk the unpowered spacecraft crashing on the surface of icy moons like Enceladus, which has a subsurface ocean that is a great candidate for harboring life. If Cassini crashed on that moon, it could contaminate any possible life that may exist there, and that would be, as scientists say, very very bad. That’s a feature in Saturn’s atmosphere. Some sort of storm or vortex? Portal to another dimension? Saturn’s cloaca? I’m sure we’ll be getting lots more information soon; in the meantime, it’s just fascinating to see these images so quickly after Cassini made its close pass. Another intra-ring pass is scheduled for May 2.